I cant tell you how HAPPY I am that today is Friday! As of yesterday(Thursday) I am done with working days and go back to nights on Monday, as our school year starts Aug.17. I am ecstatic! I am NOT a morning person and so getting up at 6am all summer does not make me happy! I much prefer the school yr when the husband is up with the kids in the morning and I am snoozing away, happy to see my kids when they get home from school and I am wide awake and in a good mood! 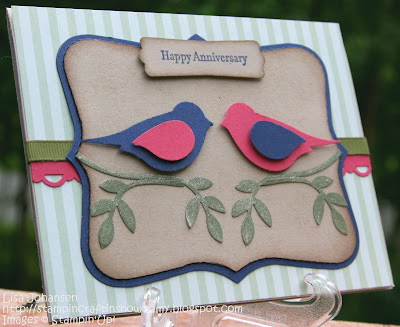 I also discovered that I am seriously lacking when it comes to anniversary cards, and I know I cant be the only one out there with this problem, so hence the 2nd part of the mashup! 3. MASH IT UP and create an anniversary card that has glitter on it somewhere! 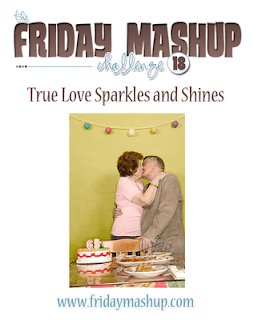 Head over to the Friday Mashup blog and check out all the wonderful inspiration from the design team and then play along with us! Dont forget to check out the other cards submitted and leave some love for your fellow crafters! Its a bit hard to see but the leaves the birds are perched on were painted with Champagne Mist Shimmer Paint, giving them a very nice subtle gold glittery effect. Hi Lisa, I have to say thanks to Courtney for her fabulous contribution to this weeks challenge. I LOVE bling and glitter and all that girly stuff so this is right up my alley! Your card is lovely...do I detect a small amount of glitter on those leaves??? Such a sweet card, Lisa. Your matted Top Note is perfect and I love the way you did the birds - and, yeup, ya can see the glimmer of dew on the branches! I would of expected more Glitter here Ms. Lisa I don't know if this is a Courtney approved creation or not..lol I love the birds together like that, this is one punch I still need to add to my collection. I really like the color combo you used as well. I love how you did the birds. The opposing colors look fantastic! And I can definitely see the glimmer on the leaves! Very sweet card! I didn't notice the shimmer at first...but what a nice, subtle touch!